Want to print high quality photos or BIG prints from all those pixels in your 5D? 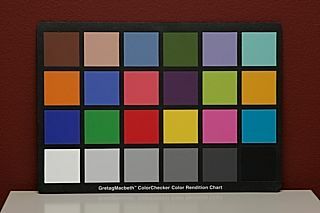 Need to calibrate the color on your system to get the most of your investment? Check out our Qimage photo printing software and our Profile Prism ICC profiling software. 11/17/2005 Our own custom EOS 5D profiles for RawShooter Premium! Every once in a while I do a brief technical comparison between two cameras from the standpoint of image quality alone. I usually take the time to do these comparisons whenever there is a new dSLR that I feel breaks some new ground. The last time I did a technical review was when the Sigma SD9 hit the market with it's full color capture capabilities. Now the Canon EOS 5D claims to break new ground by being the first full frame 12.7 megapixel camera that, while not exactly affordable unless you have a business based in photography, at least it won't require trading in a car to own one. My desire to take a look at image quality from an objective standpoint in a comparison of the 20D versus 5D stems from the fact that the 5D now has a larger full frame sensor compared to the smaller APS size sensor in the 20D. The 20D has a 22 x 15mm sensor compared to the 5D's 36 x 24mm sensor. That means that the 5D puts 1.6 times as many pixels on a sensor that is 2.5 times the size when compared to the 20D. That should equate to higher quality images with lower noise levels. Will the 5D live up to the numbers? Let's take a look. Imagine my surprise when I take my 5D out of the box, hook everything up, and begin my technical testing only to find that the 5D is returning numbers that make it look like a bit of a lame duck compared to the 20D that I'm running side-by-side. After many hours of testing and trading photos with others in some online forums, I find that my first 5D is defective! To make a long story short, my initial 5D had subtle pattern noise that you had to zoom in to see, but was visible in literally every shot. I tried different lenses, different memory cards, and different settings just in case, but no luck. No matter what I did, I got the same underlying 4x4 noise pattern. The noise manifested itself visually as either banding or a "burlap" appearance that was visible in lighter colors and could be seen at 1:1 zoom on screen in every shot if you knew where to look. Given the 4x4 pattern of the noise, I suspect the problem was somewhere in the red or blue gain circuitry that is involved in collecting a charge off the sensor. I'm sure this problem would go unnoticed by a fair number of people. If anyone else had gotten this camera, the only thing they may have noticed is that their images looked a little "sloppy" when they tried to do large prints and they might complain that their 5D didn't produce that silky smooth look that is the Canon dSLR trademark. After about 3 days of trying to get the first 5D to work properly, I ended up returning it as defective and getting a second 5D. The second 5D had a serial number about 5000 units after the first one and worked perfectly. The pattern that plagued the first one was nowhere to be found in the second 5D. Right now it appears as if this is a one-up problem and is not related to a bad "batch" of cameras since I've examined images from about a dozen other people and cannot find the same problem in any other 5D cameras. The following shows the problem clearly. 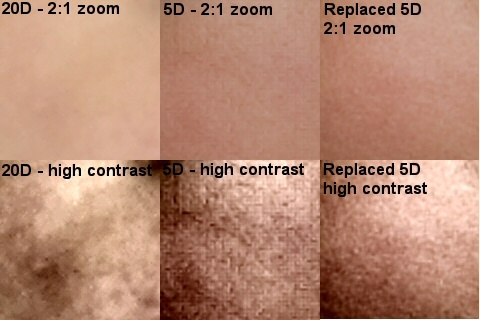 These are skin tone patches shot under identical (as close as possible) conditions and settings. 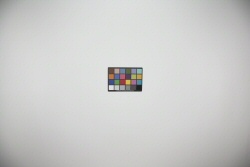 The middle column is the defective 5D and the right column is my second 5D. 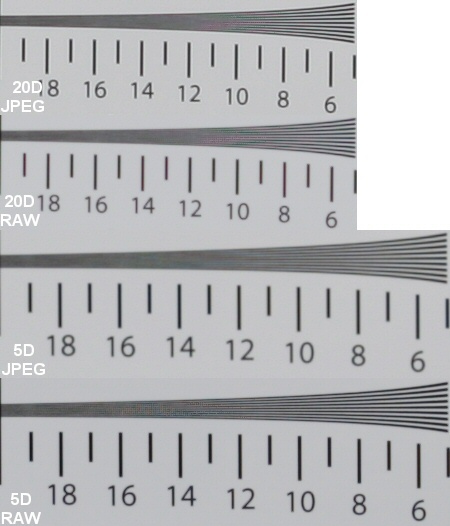 It's tempting to believe that the artifacts in the middle column are JPEG artifacts because they do look quite similar (like a highly compressed JPEG), but these images have never seen JPEG mode until being converted for this page: they went straight from raw to TIFF and are only displayed below in JPEG format to save space. 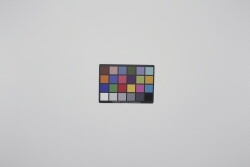 While the image below is a JPEG, the uncompressed TIFF has the same artifacts. With the defective 5D a fading memory, I set off to do a few tests. I had high hopes from the beginning for the 5D because its sensor has larger pixels due to the larger sensor size. This usually means less noise and better detail due to higher signal-to-noise ratios. For my tests, I shot both cameras in RAW + JPEG(L) so that I could get an indicator of performance for in-camera JPEG's and also raw images decoded using the included Canon Digital Photo Professional 2.0.1.4. Lighting, exposure, and camera settings were matched as closely as possible and the same high quality lens was used for all tests (Canon EF 24-70 f/2.8 L). Being used to the menus on the 20D, I was already familiar with going through the menus and setting the color space to Adobe RGB and making sure that the camera was otherwise set to default settings. This threw me for a loop initially because when set to the default "Standard" setting for picture style, the 5D returned photos that were way too contrasty and saturated, often blowing out highlights and muddying the shadows. It took me some time to figure out that you need to set the 5D to "Faithful" to produce color close to that from the 20D defaults. It is a bit odd because both the "Standard" and "Faithful" settings show the same sub-settings for all the visible parameters on the "jump" submenu so they look the same, but they are not! 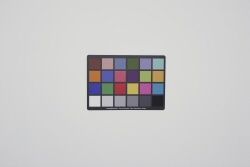 Once set to "Faithful", the 5D produced colors that looked almost identical to the 20D save for reds that appeared just a hint "deeper" on the 5D. I didn't spend much time on color because I've found the 10D, 20D and 5D to be quite accurate with respect to color (provided you set the 5D to that "Faithful" mode). Here are the GretagMacbeth color targets for the 20D and 5D side by side. These are the JPEG's from the camera displayed here in sRGB color space for better viewing on the web. I don't see much benefit in comparing color from the raw files since most of the raw conversion tools that I would trust for color don't even support the 5D as of this writing and getting accurate color from raw files is no more complicated than using good raw software. I found that the Canon DPP software produced nearly identical color to the JPEG's from the camera, which you'd expect. The resolution tests were interesting. While the 20D pulled in about the same numbers on my standard resolution target in both JPEG and raw mode, the 5D seemed to do significantly better in raw mode. It appears that JPEGs from the camera are a little more conservative on the 5D in that they "cut off" before the extinction resolution in order to eliminate artifacts. The raw files carried through further on the horizontal and vertical resolution but little speckles started to appear between the black resolution bars at about the same resolution where the JPEGs started to smudge them together. There appears to be some room for improvement here and I think once the high end raw converters become available for the 5D, we may see some incredible resolution numbers. For now, the numbers from the JPEGs fall a bit short of my expectations given the 12.7 versus 8.2 megapixels of the 5D and 20D respectively. 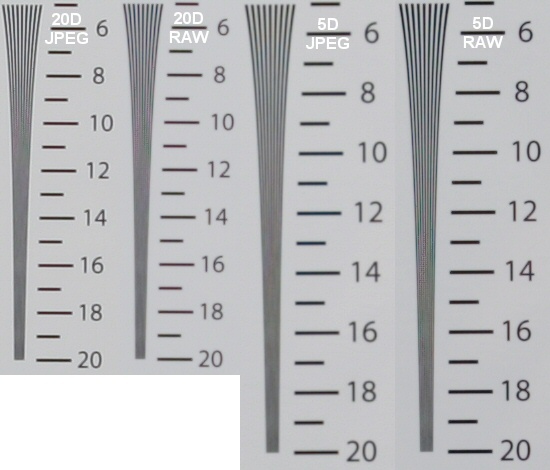 The resolution numbers from the raw files of the same shot decoded by Canon's DPP, however, prove that there is more under the hood than you are getting with JPEG. The raw numbers from the 5D resolution shots actually exceed the 1.25x in each direction that you'd expect when comparing the 5D to the 20D. Keep in mind when you look at the resolution target crops that the target was shot at twice the usual distance so you have to double all of the values you see in the resolution chart image crops below. The 5D does extremely well with respect to noise levels at different ISO equivalent speeds, but that's no surprise coming from a Canon dSLR. What is surprising is how well the 5D performed at ISO speeds of 400 and above. Interestingly, the 20D did very slightly better than the 5D at ISO 100 and 200 when shooting in JPEG mode. I attribute this to possible differences in how the camera is encoding JPEGs and how much sharpening the two cameras apply under different settings. The following graphs represent red, green, and blue channel noise for both cameras. I took a controlled shot of a gray card at different speeds, being careful to keep exposure consistent, and the following curves show the level of noise in each channel with the data in Adobe RGB color space. 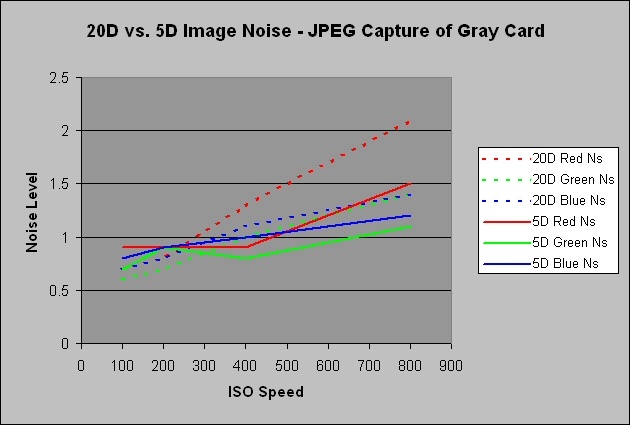 The first graph refers to JPEG while the second graph is for the raw image converted with DPP (with no tweaks or changes). 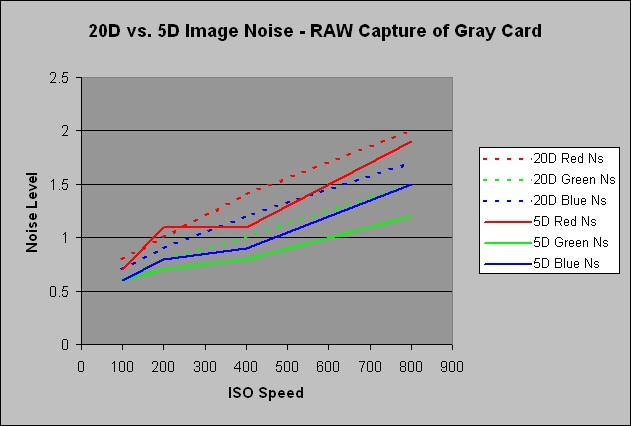 As expected, the 5D returned consistently lower noise levels at all ISO speeds when shooting in raw mode with both cameras, and the gap widened as ISO speeds increased with the 5D showing considerably less noise at ISO 800. Since the above noise graphs only show the level of noise in a single middle gray subject, I thought it might be useful to plot noise levels as a percent of signal strength versus luminance going from dark to bright in the image. 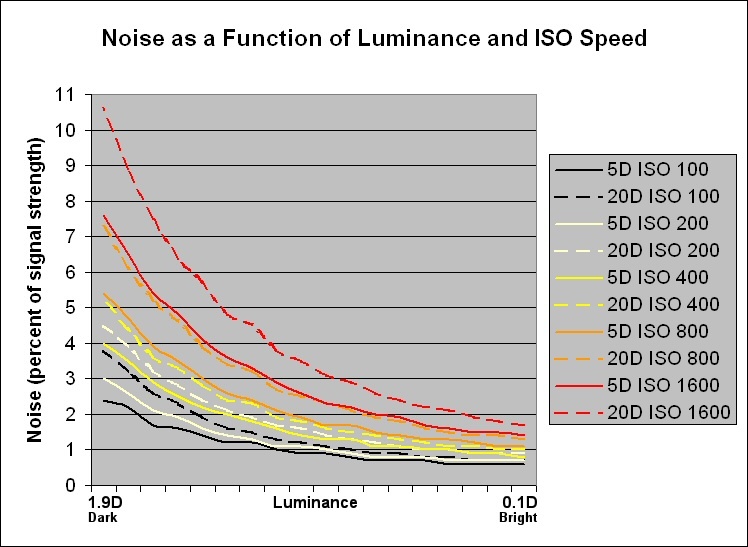 The graph below shows noise levels as they appear in a 16 bit/channel linear TIFF derived from a properly exposed raw file. I think I alarmed a few people (including myself) when I initially posted my dynamic range tests with results showing that the 5D captured less dynamic range than the 20D. Fortunately, after completely redoing the tests using a more accurate stepped gray scale and updated dynamic range assessment software, my results are now much more consistent with what one would expect from dynamic range testing of these cameras. After sorting out the "bugs" in my methods, the 5D comes out on top where you would expect it. Note that my latest tests are on the conservative side because they show the number of stops between the maximum exposure that the sensor can capture and my own definition of the lowest "usable" signal defined as the point where noise begins to exceed 25% of the real signal level. As such, my numbers, while consistent, may be lower than other published numbers for dynamic range since most published numbers refer to "absolute" dynamic range: the difference between the maximum signal and the noise floor. In any case, using my more conservative definition of dynamic range, the two cameras compared quite nicely with the 5D pulling out about 0.2 stops more dynamic range at ISO 100 up to about a half stop more at ISO 1600. That may not seem like a lot, but we're dealing with a bigger sensor that also has 1.6 times as many pixels. Also remember that stops are exponential so the difference between the 5D's 8.9 stops at ISO 100 versus the 20D's 8.7 stops is actually a 16% difference. 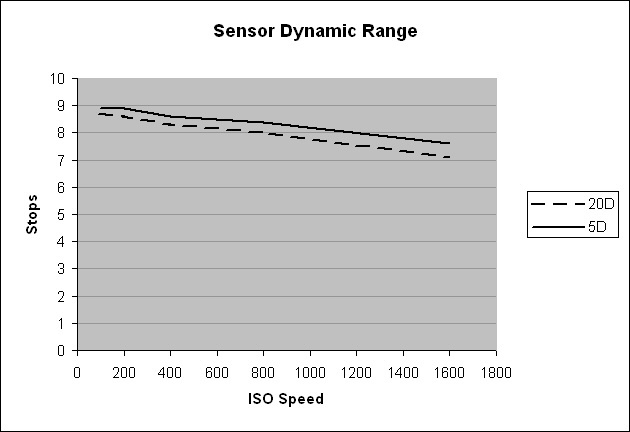 Similarly, the 5D's 7.6 stops at ISO 1600 versus the 20D's 7.1 stops gives us a 32% difference in dynamic range. In this test, just like the noise test, the 5D pulls away as you go to higher ISO speeds. Many are recommending Canon's 24-105 L IS lens as the perfect match for the 5D. While I won't argue with that assessment, I was somewhat taken aback by the amount of light falloff (lens vignetting) at the 24mm end with this lens mated to the 5D. With cameras like the 20D, the 1.6x center crop has spoiled many of us into thinking that light falloff in the corners is never an issue. With full frame sensors, you actually get to see what's at the corners of your lens and it isn't always pretty. Having worked with a few full frame cameras, I wasn't surprised to see light falloff at the full wide angle end of the lens with the aperture wide open, but what did surprise me was that the light falloff was still easily visible under proper exposure of light backgrounds with the aperture stopped down to f/8 and even smaller! This is something to be aware of should you be in the market for moving from a 1.6x to a full frame camera. You may be able to use the lens as designed and recover some of that wide angle functionality, but there is a price to be paid. Of course, light falloff is easily corrected in many photo editing tools but this does add another step to your workflow and in severe cases, can result in visible banding/posterization when you have to correct this problem on say an underexposed shot containing a blue sky. Some may see this as an unfair comparison since cropping the center out of the 5D photos to give you the same effective image size will certainly get rid of the light falloff as it does with the 20D's smaller sensor. Also note that this isn't a 5D or camera body issue: this light falloff issue has been noted on other full frame dSLR's as well since it is inherent to all 35mm cameras to some degree. For me, it's just an issue of learning how to use a new tool. I will, for example, be careful about shooting at full wide angle range of my lenses and will probably turn the dial just slightly off the 24mm end up to 30-35mm in each shot unless the 24mm focal length is absolutely necessary. I tiny turn of the zoom dial to get it off the 24mm end seems much more effective than trying to stop down the aperture as you can see in the samples below. So if you are shooting with a bright background and you have the choice, bump the lens off it's 24mm stop a bit and take a step or two back to compensate. I also tested the 5D with the Canon 24-70 f/2.8 L lens to see if a lens with a larger aperture helps the situation. It does, but as you can see, light falloff is still easily visible with the 24-70 wide open at f/2.8. Fortunately by about f/4, the problem is less noticeable. Here are the results of my testing. The 5D is certainly an excellent camera in every respect. In addition to fantastic image quality, it also boasts long awaited features like a real spot metering mode and an LCD preview screen that is huge in comparison to the 20D and its predecessors. I'll leave playing with the controls and taking the "money shots" to the other reviewers but I've certainly enjoyed my head to head comparison and hope that others can benefit from the information here. Say what you like about form factors, 1.5x - 1.6x versus full frame, but I suspect full frame sensors might be here to stay after these initial entries come down in price a bit. And for those of you who don't want to give up your 20D for a 5D because you do a lot of telephoto shots and you actually like the 1.6x form factor, remember that the 20D might have a 1.6x form factor to get you closer with telephoto but the 5D has 1.25x the pixels as the 20D on both axes so you can recover at least some of that extra "magnification" by just cropping your photos since you have so many pixels to work with. As an added benefit of the 5D, you get to use your lenses as they were designed to produce the proper zoom range, depth of field, and apparent subject-to-lens distance ratios. Did you find this article interesting? I also write articles each month for Tech Corner at Steve's Digicams. Just go to Steve's Digicams and click "Tech Corner" from the main menu for a list of articles related to topics in digital imaging such as color management in general, specific techniques such as rendering intents, soft proofing, sharpening, understanding printer page size versus image size, and many more.